A magnificent blend of modern and architecture and avant-garde design elements that are designed to stand the test of time. Strategically located on the city fringe, nestling between locations filled with rich history and cultural heritage, Forte Suites at 88 Mergui Road is an upcoming new launch residential development by Forte Development Pte Ltd . This freehold project is 25th storey high and has a total of residential 106 units. All units offer exquisite finishing and fittings with a soaring celling height of at least 3.2m. 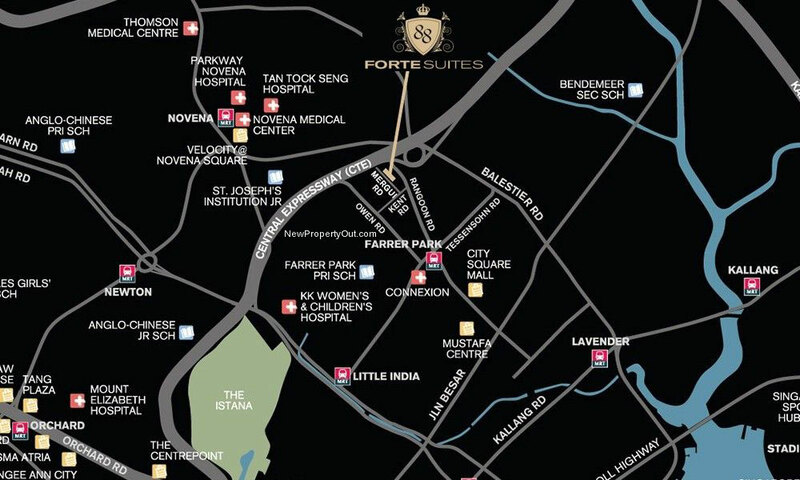 Being less than 700m from Farrer Park MRT station, Fortes Suites is less than a 10 minutes stroll away. From mega shopping malls such as City Square Mall and 24 hours Mustafa Centre to Peh Kio Food Centre and Little India, the home to all type of famous cuisines are also within close proximity to Forte Suites. With the easy access to the wide range of amenities, the residents of Forte Suites will be spoilt for choice.